Today sees Alex Arnout and Daren Nunes launch the new DMK imprint with Kuba Sojka’s ‘Circle Of Thought’ EP, comprising two original tracks from the Polish producer. Myslowice, Poland born producer Kuba Sojka aka Psi-Acoustic seems to have been carving out quite the career over the past few years, working with imprints such as Matrix Records, ROHS! 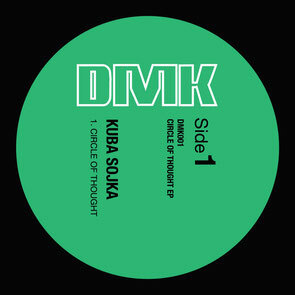 And Mathematics Recordings and Dogmatik, where he released the ‘You Can’t Take It’ EP. Here we see Sojka enlisted to launch the brand new imprint from founder of the Dogmatik imprint, Alex Arnout and Daren Nunes. Opening up the release is title cut ‘Circle Of Thought’, seeing Sojka explore his signature experimental sound with evolving 8-bit style synth lines, swirling pad textures and subtle processing throughout the track’s seven-minute duration. While punchy outboard drum sounds and an underlying sub-heavy tension generate a weight dance floor appeal to the cut. On the flip side to close the release is ‘Progression’, which as the name would suggest is laid over six and a half minutes with an ever-blooming, unfaltering feel. Sojka enlists rock sturdy rhythms as the driving force, while multi-layered string melodies, jazz synth licks and rugged low-end tones create the expansive and atmospheric vibe of the composition.